See also: Carolina Israelite; "Fool-Killer", Andy Griffith. Humor has played a distinctive role in the lives of North Carolinians from the days of the earliest British explorations to the region. As much as any other aspect of human life, humor can be considered a window into cultures and peoples that have long since disappeared. U.S. senator Sam J. Ervin Jr., an insightful student of North Carolina humor, summarized the state's affinity for the lighter side of life in a speech to members of the North Carolina Literary and Historical Association: "North Carolinians have always loved to laugh. Their own merry hearts and the many humorists abiding among them have always enabled them to indulge this love." North Carolina humor has been mined from all levels of the human condition, from the most powerful offices of government to the simple lives of poor farmers and tradesmen. Folk humor, by both blacks and whites, has been conveyed between generations primarily through oral means. It is rooted in the mundane details of life, such as work, family, community, religion, and getting along (or not getting along) with one's neighbors. Englishman John Lawson, after visiting the young colony in 1701, described many amusing sights and experiences in A New Voyage to Carolina (1709). His frank, often witty observations concerning the native culture and animals, as well as the Europeans' interaction with local Indians, stand as the first written examples of North Carolina humor. Lawson observed, for example, that "most of the Savages are much addicted to Drunkenness, a Vice they never were acquainted with, till the Christians came amongst them." Such biting humor appears throughout A New Voyage to Carolina, making it an insightful and entertaining work for modern readers. Humor has a way of connecting a generation with its predecessors, whose sophistication the modern mind may tend to underestimate. It may surprise contemporary North Carolinians that the state's first century left many examples of "verbal play" that are often more subtle and urbane than what passes as first-rate humor today. In addition, coarse, raw humor is not a modern invention: shocking and ridiculing people has always been the humorist's fertile ground. Ham Jones, a graduate of the University of North Carolina, became acclaimed for his "Cousin Sally Dilliard" sketches that poked intuitive fun at southern life and culture-particularly its court system (Jones was a lawyer by trade). Charles Napoleon Bonaparte Evans, the editor of the Milton Chronicle in Caswell County from 1841 until his death in 1883, found fame through his "Fool Killer" letters, which were allegedly written by a man wielding a club with which he threatened or actually brained those he found annoying or deserving of his wrath. Only a handful of these brutally hilarious letters remain. Other nineteenth-century humor exists in the form of news items that strike the modern reader as absurdly funny. The Carteret County Telephone (7 Apr. 1882) ran this important news item: " LOCAL. While whittling with his axe, William Weekly chopped off his entire little finger. No trace of the finger has been found and it is assumed that one of his chickens got it." Zebulon Baird Vance, North Carolina's Civil War governor and later a U.S. senator, was one of the state's most influential figures as well as a seemingly endless source of humorous retorts and observations. His brilliant wit, rooted in a salt-of-the-earth intellect that came from his Buncombe County upbringing, was known throughout the nation. Perhaps the most famous one-liner in North Carolina history-"What did the governor of North Carolina say to the governor of South Carolina? 'It's a damn long time between drinks'"-has even been attributed to him by some historians. Whether or not this was his line, Vance left more than his share of memorable and amusing witticisms. In the twentieth century, the works of author Thomas Wolfe and playwright Paul Green, although serious art, were nevertheless laced with much humor and wit. Writer and newspaper editor Harry Golden, who moved from New York City to Charlotte in 1941, took on such vital issues as race relations and civil rights with his brand of broad humor. 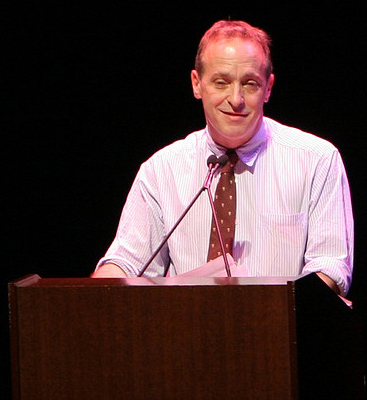 Contemporary author David Sedaris, in his books, on public radio, and onstage, has entertained audiences with stories of his North Carolina childhood in Raleigh. Sam J. Ervin Jr., "Humor, Wise and Otherwise," NCHR 59 (April 1982). F. Roy Johnson, Oral Folk Humor from the Carolina and Virginia Flatlands (1980). Loyal Jones and Billy Edd Wheeler, Laughter in Appalachia: A Festival of Southern Mountain Humor (1987). Charles O. Pitts Jr., ed., Carteret Fish 'N' Chips: Nineteenth Century Newspaper Humor (1988). Richard Walser, ed., Tar Heel Laughter (1974). Rakoff, Evan Smith. "The Funny State: How North Carolina comedians are redefining American humor." Slate.com. August 9, 2012. http://www.slate.com/articles/arts/culturebox/2012/08/north_carolina_comedy_from_andy_griffith_to_zach_galifianakis_.html (accessed August 23, 2012). Ervin, Sam J., Jr. Humor of a Country Lawyer. Chapel Hill: University of North Carolina Press, 1983. http://books.google.com/books?id=2wSSYEaipwoC&lpg=PP1&pg=PP1#v=onepage&q&f=false (accessed August 23, 2012). Sedaris, David. "Go Carolina." Me Talk Pretty One Day. Little Brown and Company: 2000. http://web.archive.org/web/20110723005117/http://www.hachettebookgroup.com/books_9780316777728_ChapterExcerpt%281%29.htm (accessed August 23, 2012). Taliaferro, Hardin E. Fisher's River (North Carolina) scenes and characters. New York: Harper & Brothers. 1859. http://books.google.com/books?id=GxoeAAAAMAAJ&pg=PR3#v=onepage&q&f=false (accessed August 23, 2012). Andy Griffith Football Story from 1953 [What it Was, Was Football]. YouTube video. 5:40. Uploaded by cornerstoneindy. October 20, 2007. http://www.youtube.com/watch?v=oNxLxTZHKM8 (accessed August 23, 2012). Blythe, John. "Early American humor, courtesy of Henderson’s 1812 Almanack for North Carolina." North Carolina Miscellany (blog). January 11, 2012. http://www.lib.unc.edu/blogs/ncm/index.php/2012/01/11/early-american-humor-courtesy-of-hendersons-1812-almanack-for-north-carolina/ (accessed August 23, 2012). 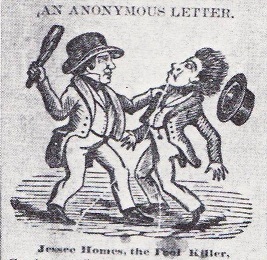 "Jessee Homes [sic], the Fool Killer," from Stokes, Durward T. "The Fool Killer Rides Again in the Seventh Letter Found." North Carolina Folklore Journal 26, no3, 1978. p. 171-172. Boone, N. C.
Huang, Michael. "David Sedaris-2." San Jose Center for Performing Arts, San Jose, California. October 29, 2007. From Flickr user mhuang. http://www.flickr.com/photos/mhuang/1803040968/in/photostream/ (accessed August 23, 2012).